Your lawn is withered and overgrown and you are wondering what to do? We can help you solve this problem as we are an established lawn mowing services provider and operate throughout Hammersmith and the nearby boroughs. 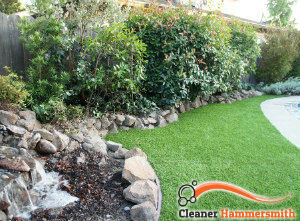 Our extensive experience and competence allow us to revitalise even the most overgrown lawns. We have invested in professional mowing machines, which allow our competent and insured gardeners to mow big and small lawns alike. You don’t have to worry about the costs as our pricing is exceptionally easy on customers’ budget. As you can see we have tailored a high-standard service which will surely meet the requirements of even the most demanding customers. 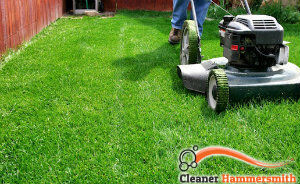 The service is performed by professional gardeners who know what it takes to revitalise even the most neglected lawns. Our gardeners can visit you for a free on-site estimate to determine what height the grass needs to be cut at so that it grows healthy and dense. The team is fully-equipped with advanced mowers. Once most of the grass is cut, the gardeners will proceed to trim around your fence, pathway and flowerbeds to lend your lawn a neater appearance. You don’t have to worry about the clippings as our employees will collect and dispose of them free of charge. If you wish, the cut grass can be added to your compost. Provided that your lawn is plagued by pests, the gardeners will choose suitable repellents to solve this problem. Customers get to choose between one-off sessions or various regular lawn maintenance packages, available at appealing discounts. If interested in booking our quality lawn mowing services in W6, you can do so by calling us on the phone or filling our online contact form!